Maine is the New England state I’ve unfortunately spent the least amount of my time in. Who knows why; everyone is always raving about the beaches and the forests and the quaint towns with their lobster rolls. This is probably a side-effect of being a child of Cape Cod; summer vacations rarely strayed far off Route 6 growing up. We did go to Kennebunkport once! If I were to spend some time in Maine though, the town of Camden would be first on my list to visit; and I’m pleased to say I will be doing so in July! 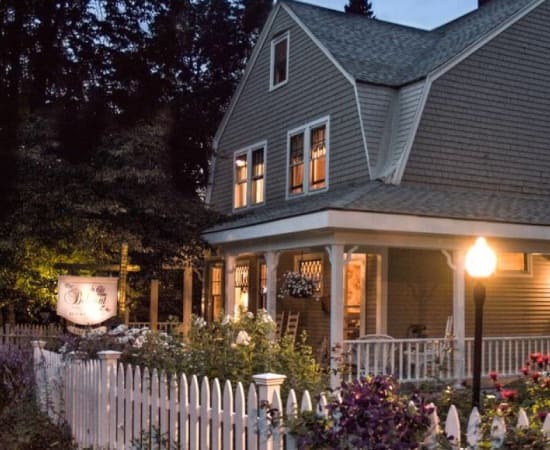 This came about by way of The Belmont Inn, a historic bed and breakfast which is under new ownership this year - a perfect time for a brand refresh! I was so excited when the proud new innkeeper, Kim, reached out wanting to give the Inn’s look a facelift. The elaborate Victorian script and lilac illustrations she had inherited were feeling a little dusty. The Belmont Inn is a big, gorgeous Queen Anne Victorian home tucked away among bursting gardens on a quiet street just a stroll away from the ocean, and I wanted to make the logo all about that iconic structure. Kim agreed. Making the Inn the face of the brand seemed obvious; it was the image that welcomes vacationers first to their home-away-from-home, and what they anticipate returning to summer after summer. So, I made a little drawing of the Inn and it quickly became the logo. Kim didn’t want to lose the nautical culture and tradition of the location as well, so we complemented the logo with seaworthy blues, whites, and greys, as well as a fun sailboat pattern that really brought the branding together. This is best seen in the Inn’s print suite, where the logo, pattern, and pallet come together and really shine on business cards, letterhead, a postcard, and note cards. The envelope is actually my favorite part, with sailboats peeking through in the lining. I can’t wait to see The Belmont Inn’s new branding be put to work this season, welcoming new travelers from around the world. Including Jake and I, when we venture out to coastal Maine at the end of July! Some logo outtakes for your consideration: still love that fly fishing gal!